The Complete History of Scary Clowns▶️ There’s a historical reason that clowns in pop culture strike fear in the hearts of audience members. Someone in Pennsylvania Is Tying It-Like Red Balloons to Sewer GratesThe Lititz Police Department would like the local prankster to stop creeping them out. The World Clown Association Blames It for Giving Clowns a Bad RapThanks for nothing, Pennywise. AHS: Cult Trailer: Ryan Murphy Brings You Political Commentary Via … Clowns?Season seven premieres September 5. 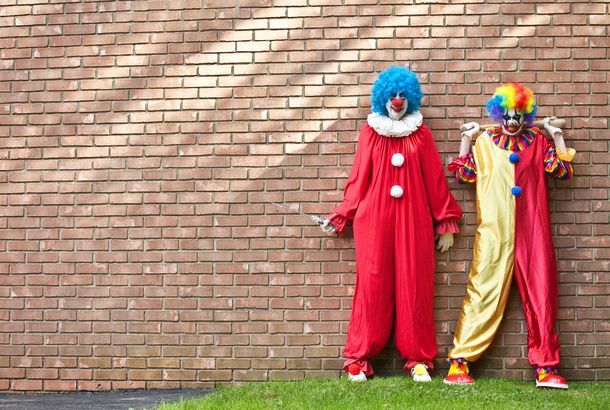 People Fear Clowns for the Same Reason They Fear UncertaintyWhy clowns’ creepiness isn’t confined to horror movies. Target Pulls Clown Masks As Creepy Clown Incidents Get ScarierViolent attacks were reported this weekend. The Scientific Reason You’re Petrified of ClownsPaging Dr. Freud. NYPD: ‘Don’t Be Afraid of the Clowns’The threat of a balloon-animal attack is essentially nonexistent. Take a Look at the First Pennywise Image From ItNot. Madonna, Dressed as a Clown, Tells Clown JokesSure, why not? Boswick the Clown Doesn’t Understand Why Adults Are So Scared of HimIs clown fear among adults a jokey affectation that has become easy to adopt as clowns fade into irrelevancy and the number of people who’ve seen one in real life dwindles? Gunman Dressed As Clown Kills Drug Cartel BossExtra scary. Here Is a Creepy Clown Mouthing the Words to Rand Paul’s Filibuster, Because ArtWatch? Richard Levine’s Clown InheritanceAnswer? It’s just very upsetting, depending on your deep-seated fears. Meet a Lady Who Holds the Guinness World Record for Owning Clown-Themed ThingsTo her credit, she sure knows how to rock the tiny hat. Last Night on Late Night: Does Stephen Colbert Fear Conan?Plus, Naomi Watts sits quietly while Jon Stewart mocks co-star Sean Penn, on our regular late-night roundup. More Fallout From the Gathering of the JuggalosMethod Man got stuff thrown at him while onstage as well. Turns Out That Juggalos Don’t Like Tila Tequila That MuchSinger is attacked by fans at live concert debut. Nineteen Things You Must Do at This Weekend’s Gathering of the JuggalosThis years Gathering promises to be full of surprises and, of course, miracles. Clown Show Delayed AgainThe first performance of Cirque du Soleil’s terrifying-seeming, clown-filled ‘Banana Shpeel’ has been delayed again. Rick Bayless, Burlesque ClownThe “Top Chef Masters” winner joins 500 Clown for two performances.